It was petrifying. 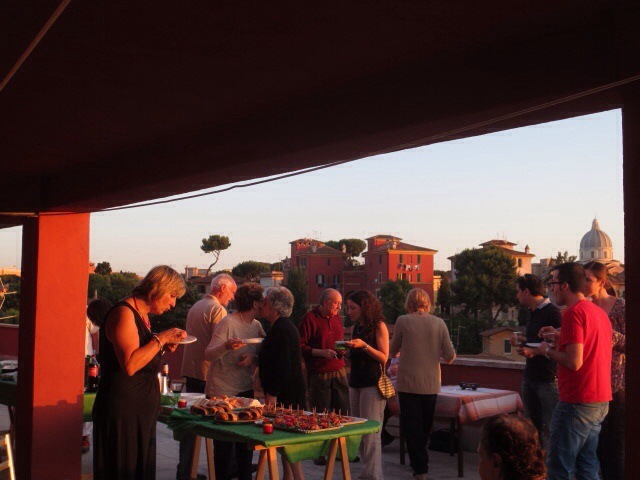 Our litlle palazzo (building) was finally lifting the five-year ban on using the gorgeous roof terrace for anything but laundry, and was celebrating this with a condominium rooftop potluck. We had been assigned a secondo and a dolce: second course and dessert. But what cook? Well, as long we brought something foreign (but not too foreign) it should be OK. 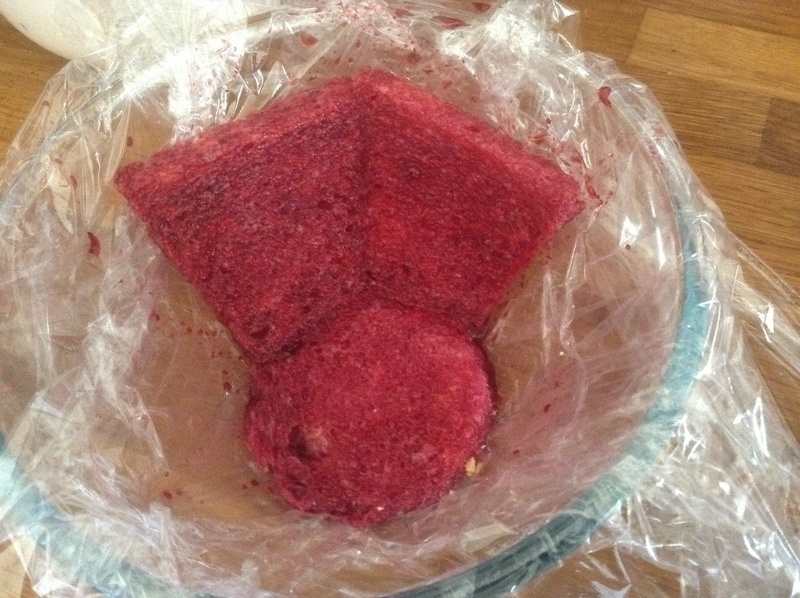 So I made Moroccan meatballs, and my husband made summer pudding. 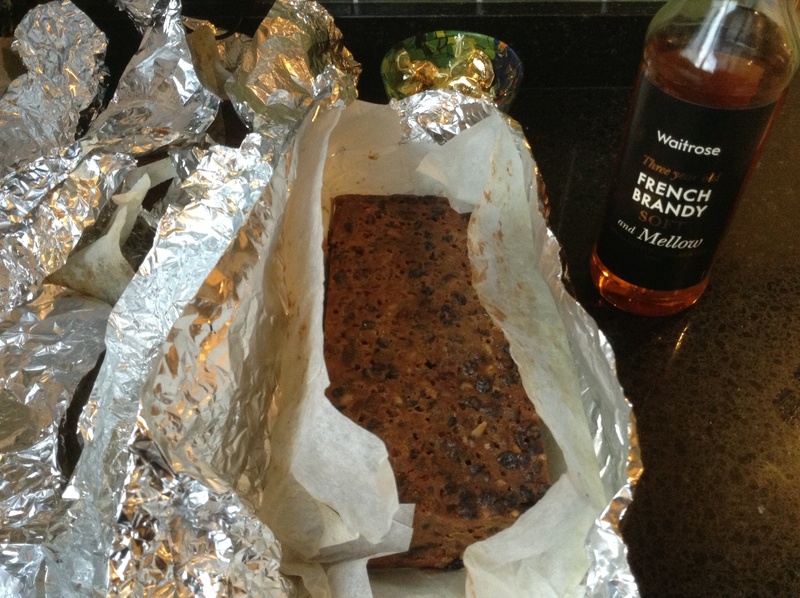 Berries, fruit, bread: very English, refreshing and tasty. 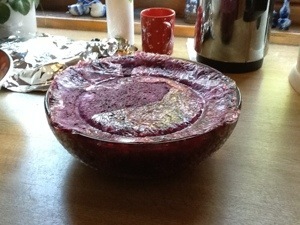 We had made summer pudding last year in Norway, very popular. 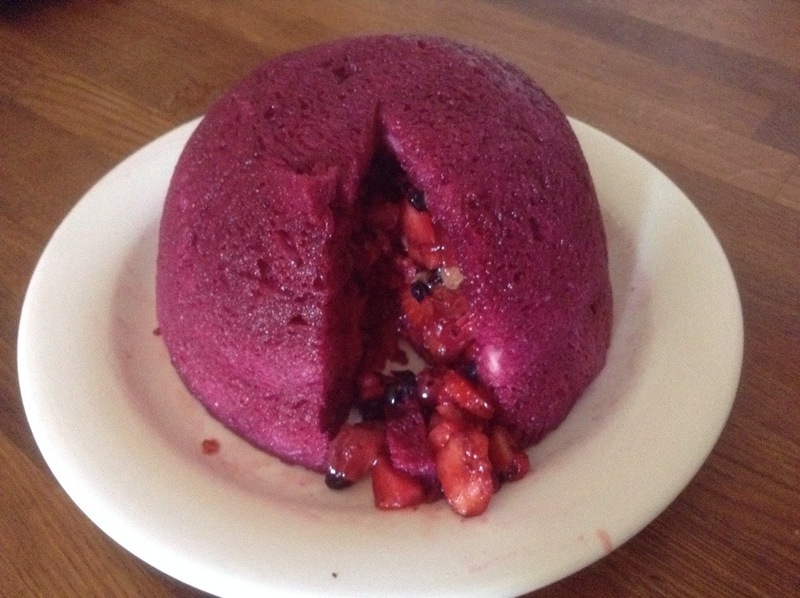 My husband used the BBC Good Food Summer pudding recipe again as a guideline, adapted to what we had. You would need something like this: 1-1.5 kilos mixed berries and fruit of your choice, 100 g sugar, 7-10 slices day-old white bread. 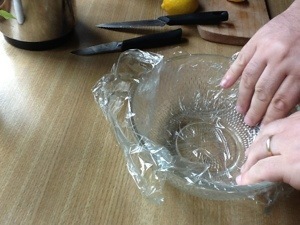 Step one: line a shallow bowl with plastic cling film, so it is easier to turn the pudding out later. 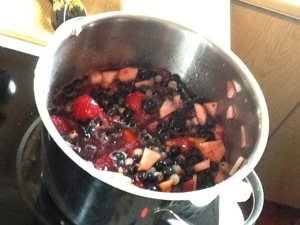 Step two: In a medium pot, add your assorted berries with a little sugar, depending how sweet your berries are. 100g was plenty for us. 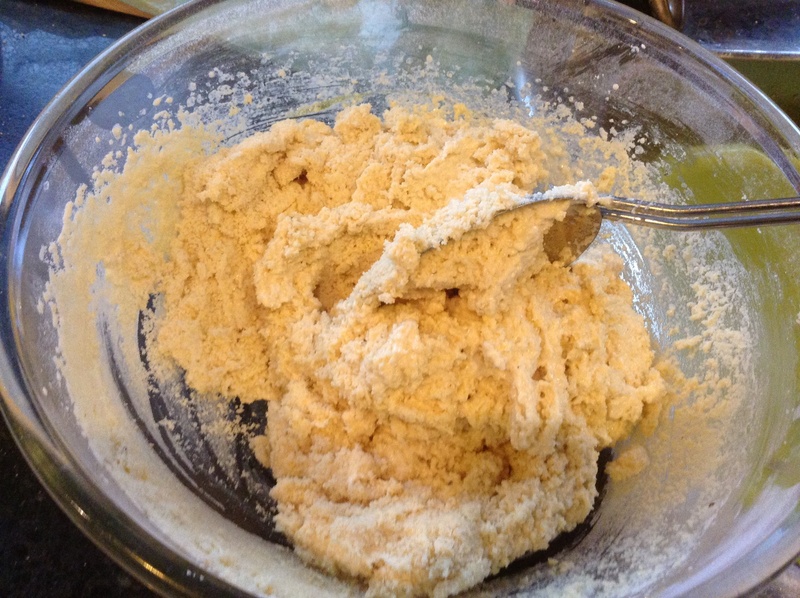 Strawberries and raspberries would often be used. 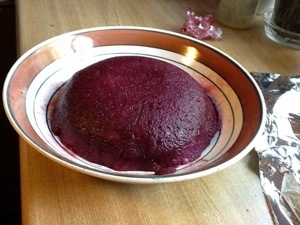 We used frozen blueberries, frozen white currants, and a couple finely chopped apples to bulk it up a bit. You need enough to fill the bread-lined bowl. 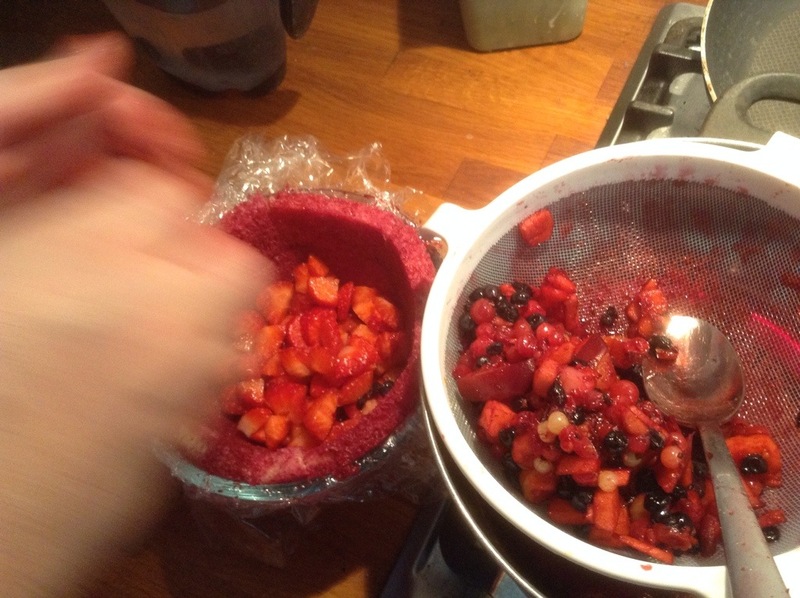 Cook the berries and fruit for a few minutes until the juices start releasing. Strain the fruit to catch the fruit juices, you will need that. 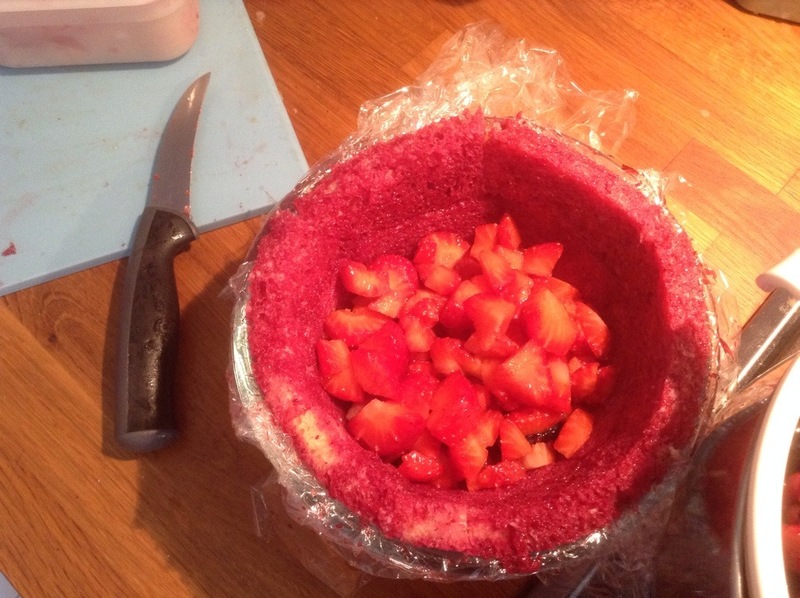 In addition, a punnet of fresh strawberries were washed and chopped, but not cooked with the others. 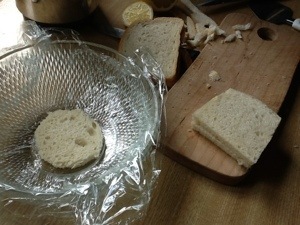 Step three: line the bowl with white bread, with the crusts cut off. 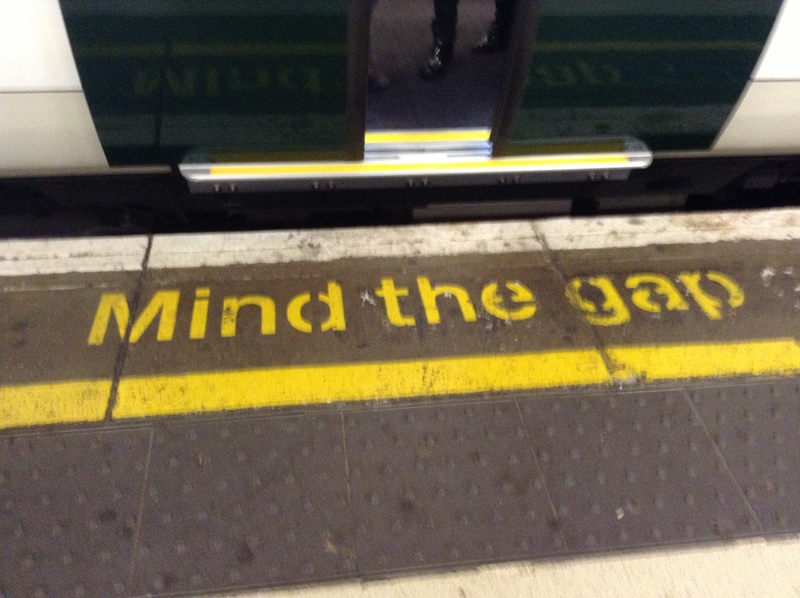 Slightly stale works better. 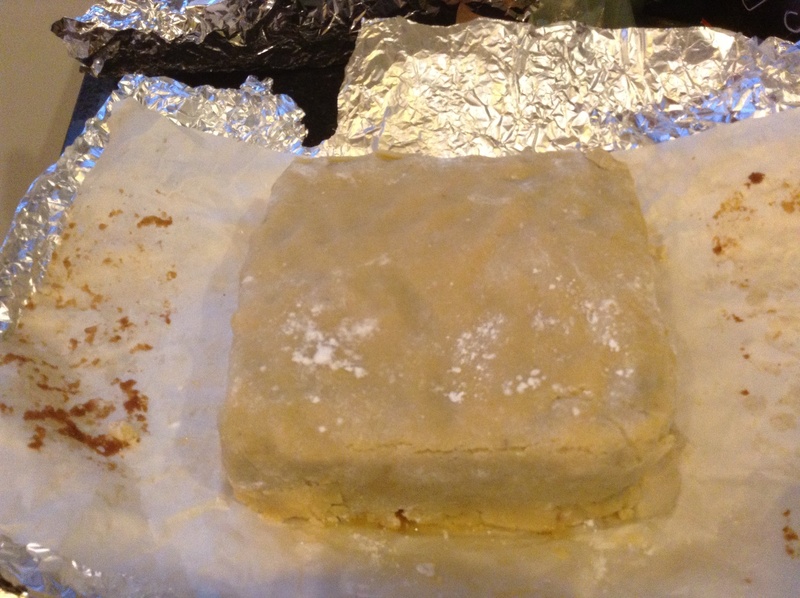 As you can see, the bread should be trimmed so it all fits tightly together. This time he dipped the cut bread in the fruit juices, then layered it in the bowl. 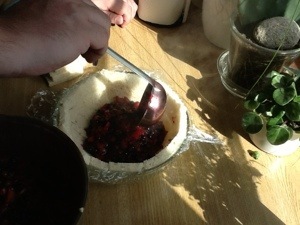 Step four: ladle over the berries and fruit mixture, into the bread-lined bowl. 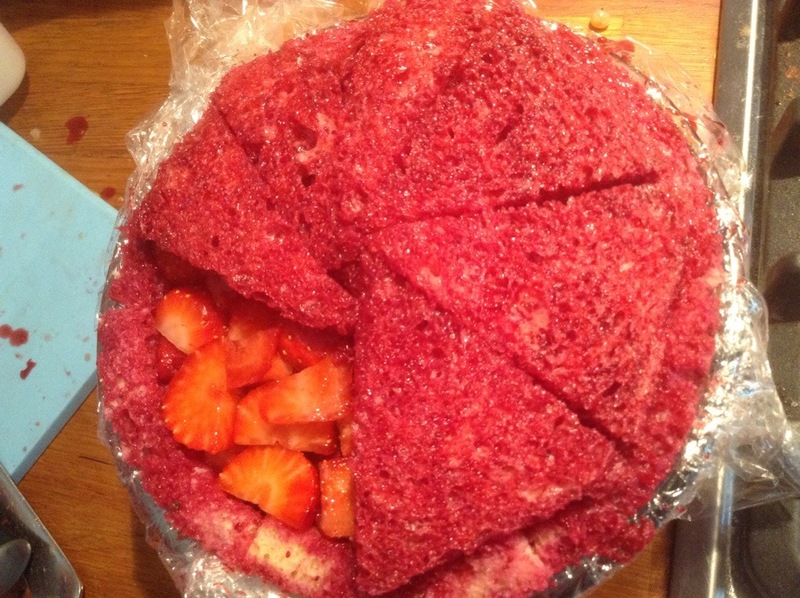 Add a layer of chopped strawberries as well. 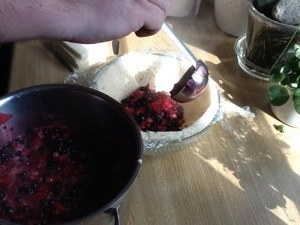 Step five: keep filling it up with cooked berries and fruit until it is almost full. Leave a little free space on top. 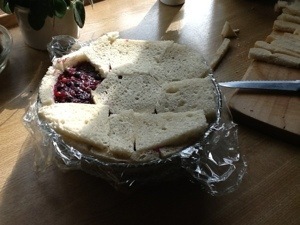 Step six: cover the top of the bowl with a layer of trimmed white bread. Again, make sure it is fitted together well. 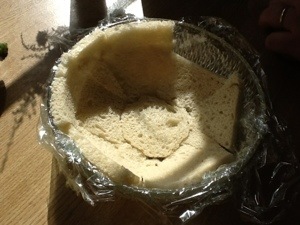 Cover with plastic cling film. Now, put the bowl on a plate (it might leak) and put this carefully in the fridge, with a small plate on top of the bowl and something heavy on top. A couple milk cartons will do. 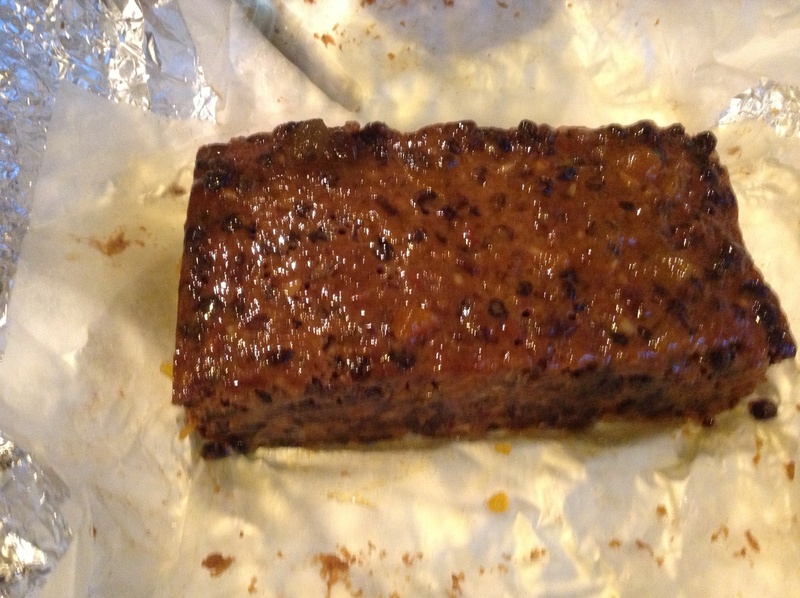 Leave in fridge for 4-6 hours. 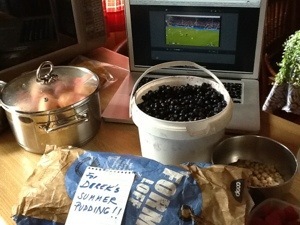 As you see, we made two summer puddings, just in case. 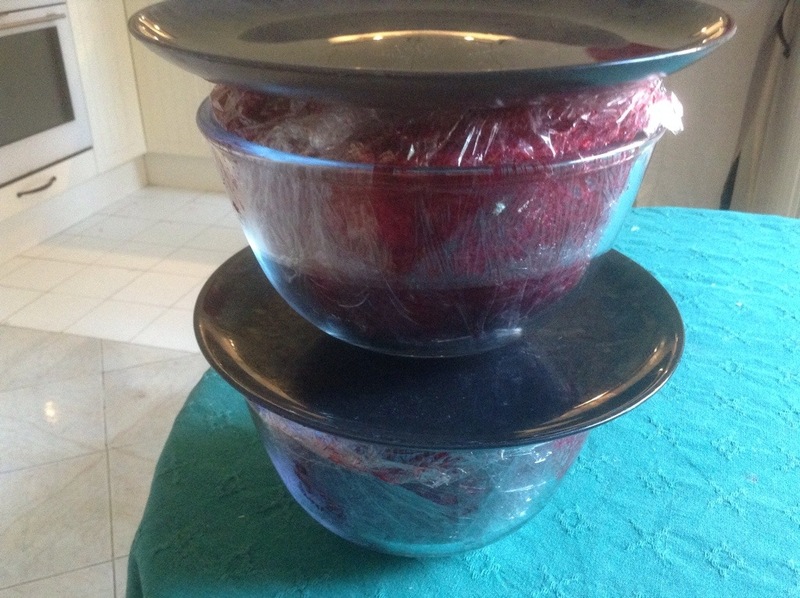 Step seven: Take the bowl out of the fridge, and peel off the plastic cling film from the top. 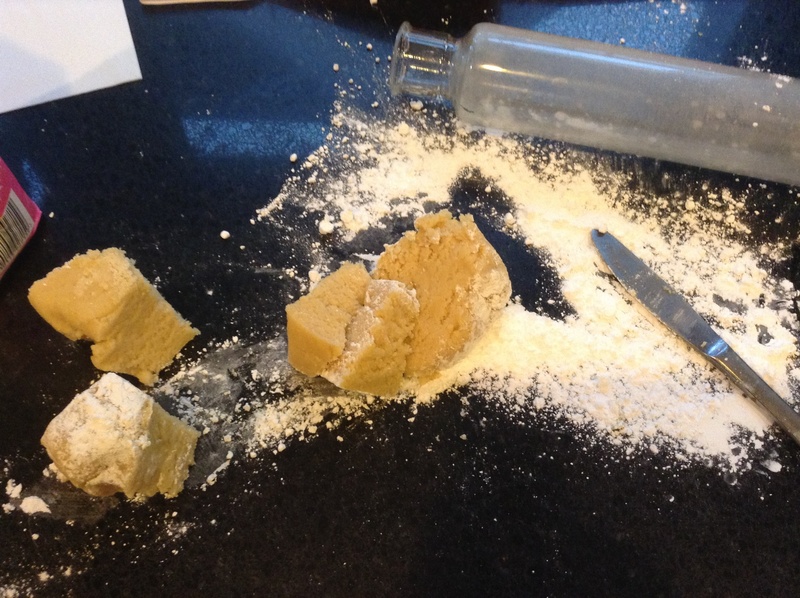 Now, invert it carefully onto a serving dish. 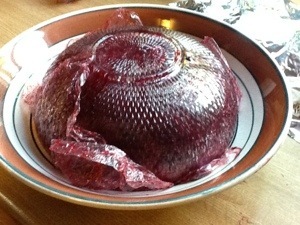 Lift off the bowl, and remove the remaining cling film. You could decorate it with some extra berries if you remember. 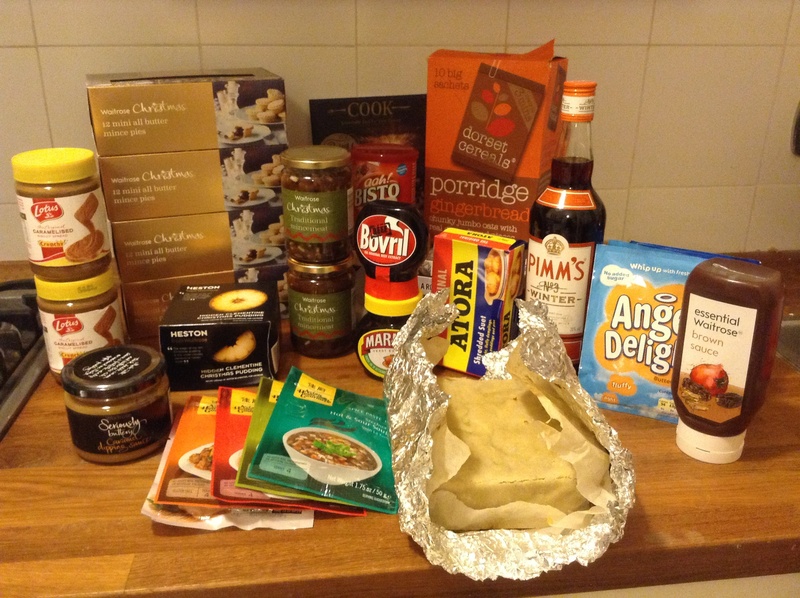 Impress your neighbours with the exotic English pudding, and give your husband all due credit. Really lovely evening, gorgeous view and a cool breeze. We stayed up there chatting until past midnight, really nice time with the neighbours. 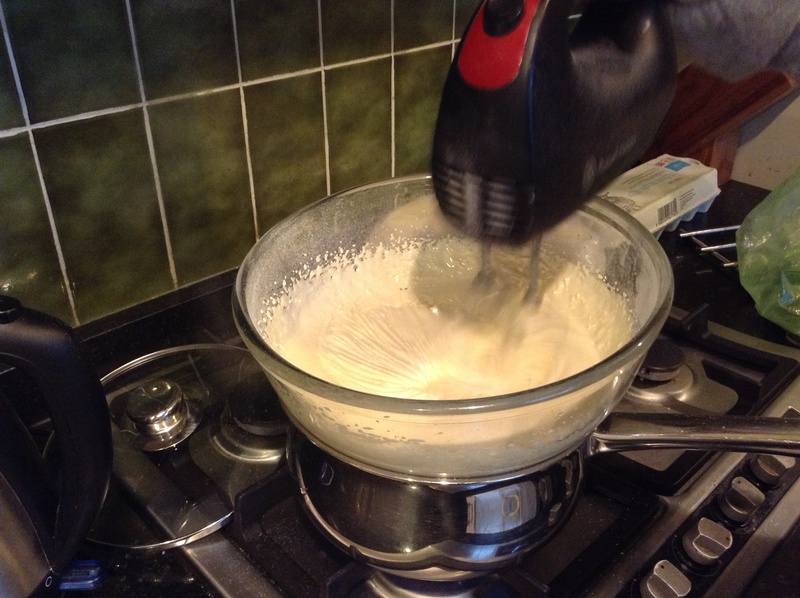 This entry was posted in food, fruit and tagged blueberries, British, pudding, summer on June 13, 2014 by krumkaker.